The last sifting effort ended in 2010. 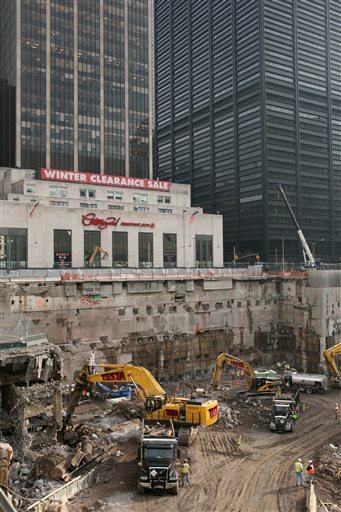 This time, crews were able to dig up parts of the trade center site that were previously inaccessible to workers. NEW YORK — Jim Riches pulled his firefighter son’s mangled body out of the rubble at the World Trade Center, but the phone calls still filtered in years afterward. The city kept finding more pieces of his son. Those are the phone calls both dreaded and hoped for among the families of Sept. 11 victims. And as investigators began sifting through newly uncovered debris from the World Trade Center this week for the first time in three years, those anxieties were renewed more than a decade after the attacks. But there was also hope that more victims might yet be identified after tens of millions have been spent on the painstaking identification process. Two potential human remains were recovered on Monday, according to the medical examiner. About 60 truckloads of debris that could contain tiny fragments of bone or tissue were unearthed by construction crews that have been working on the new World Trade Center in recent years. That material is now being transported to a park built on top of the former Fresh Kills landfill on Staten Island, where investigators will attempt to find any possible remains during the next 10 weeks, the city said. That’s the material the two potential human remains were found in. The city’s last sifting effort ended in 2010. This time, crews were able to dig up parts of the trade center site that were previously inaccessible to workers, the city said. Some 2,750 people died at the World Trade Center in the 2001 terrorist attacks, but only 1,634 people have been identified. Some victims’ families expressed impatience that the city has only just uncovered more debris. The city’s efforts to identify Sept. 11 victims have long been fraught with controversy. In April 2005, the city’s chief medical examiner, Charles Hirsch, told families his office would be suspending identification efforts because it had exhausted the limits of DNA technology. But just a year later, the discovery of human remains on a bank tower roof and then in a manhole near ground zero outraged families who said the search for their loved ones had been rushed initially. The findings prompted a renewed search that cost the city tens of millions of dollars and uncovered 1,500 pieces of remains. Meanwhile, some victims’ relatives sued the city over its decision to move 1.6 million tons of materials from the trade center site to the Fresh Kills landfill, saying the material might contain victims’ ashes and should have been given a proper burial. The lawsuit was dismissed, and unsuccessfully appealed to the U.S. Supreme Court. As it embarks on combing through debris yet again, the medical examiner’s office says it will keep monitoring the site as long as new areas are being dug or exposed. Charles G. Wolf was pleased to hear about the renewed search, though he believes that his wife, Katherine, was vaporized during the attack. Investigators have never found her remains. Years ago, it bothered him that he had no grave to visit. Wolf said the opening of the Sept. 11 memorial has filled a hole in his heart, but he’ll never have closure.